Classic Animation Style Comes to Life in New Merry & Scary DVD! Some of you may remember that my son is big into animation, and he's especially fond of some of the old-school styles of lines and drawing. 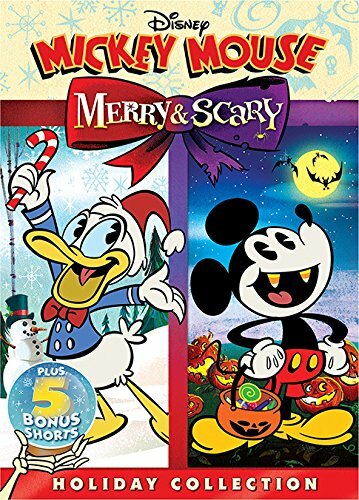 We just got done watching a review copy of Disney's Merry & Scary (now available on DVD), and he was floored by how well-done the graphics were! The hilarious DVD feature one Christmas-themed episode and one Halloween-themed episode, plus a handful of creepy Halloween shorts! My boys were very entertained by both, and we had quite a few chuckles coming from the family -- even during the spooky scenes! The DVD is rated G and has a total run time of 59 minutes -- including the bonus shorts! This DVD is an instant classic that Disney fans will love for years to come! Buy it now where Disney movies are sold! *Sample received to review from Disney Home Entertainment. Opinions are my own.